DES PLAINES, IL--(Marketwired - Mar 14, 2014) - Feldco Windows, Siding and Doors, was honored at the 24th Annual Awards for Business Excellence (AABEs) from the Daily Herald Business Ledger. Feldco President and Owner Doug Cook accepted the award on the company's behalf at the reception held at Medinah Banquets in Addison, IL. Feldco received the award in the Family Business category as an excellent example of a family run organization that thrives in the industry, experiences growth, showcases innovation with their products and makes contributions to the communities in which they serve. Keynote speaker and honoree, Tom Gimbel, Founder and CEO of LaSalle Network, highlighted the importance of having a great team, "Building business excellence and building a great company begins with hiring people who have the passion for what they do." In accepting the award, Cook explained the importance of family in the workplace, "This award goes to the exact center of who Feldco is as a company and how we do business, and that is, we embrace families." 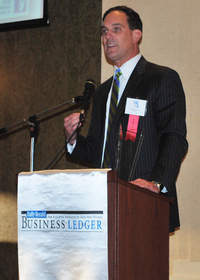 Doug Cook also received the Entrepreneurial Excellence Award from the Daily Herald Business Ledger in 2011 in the Regional Spirit Category, as an excellent example of his commitment to the growth and well-being of the region. Feldco is the Midwest's leading window, siding and door replacement specialist. Founded in 1976, the company is focused on delighting customers by making home improvement projects simple. With premium products, factory-direct pricing and certified installers, Feldco provides an excellent overall value and experience for its over 250,000 customers. The company offers free in-home demonstrations and lifetime product warranties. Feldco serves all of Central and Northern Illinois, Northwest Indiana, as well as Southern and Northeast Wisconsin. Feldco has showrooms in Chicago, Des Plaines, Rockford, and Peoria, Illinois, and Madison, Milwaukee, and Menasha, Wisconsin. Please visit Feldco's website (www.4feldco.com) or contact the company's communications center (866-433-5326) to learn more about Feldco's products and services. Feldco was named the 2007 and 2009 Dealer of the Year by Window and Door Magazine, and was also named one of the Best Places to Work in Chicagoland by Crain's Chicago Business, and a Top 100 Workplace in 2010, 2011 and 2013 by the Chicago Tribune.